This topic tracks the procedures, time and cost to build a warehouse—including obtaining necessary the licenses and permits, submitting all required notifications, requesting and receiving all necessary inspections and obtaining utility connections. In addition, the Dealing with Construction Permits indicator measures the building quality control index, evaluating the quality of building regulations, the strength of quality control and safety mechanisms, liability and insurance regimes, and professional certification requirements. The most recent round of data collection was completed in May 2018. This topic measures the procedures, time and cost required for a business to obtain a permanent electricity connection for a newly constructed warehouse. Additionally, the reliability of supply and transparency of tariffs index measures reliability of supply, transparency of tariffs and the price of electricity. The most recent round of data collection for the project was completed in May 2018. This topic examines the steps, time and cost involved in registering property, assuming a standardized case of an entrepreneur who wants to purchase land and a building that is already registered and free of title dispute. In addition, the topic also measures the quality of the land administration system in each economy. 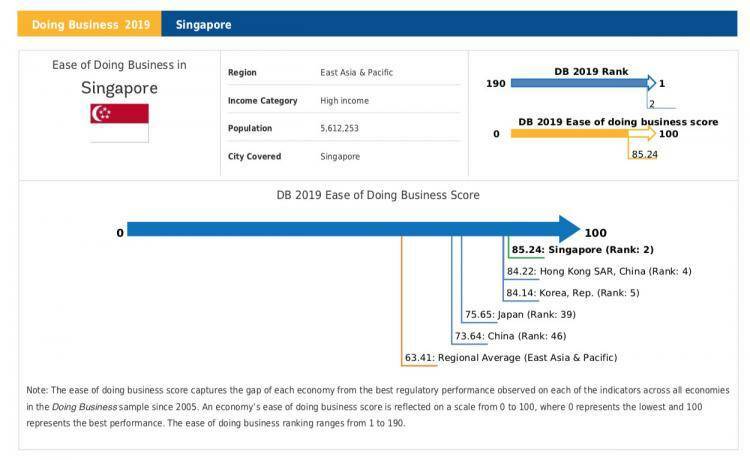 The quality of land administration index has five dimensions: reliability of infrastructure, transparency of information, geographic coverage, land dispute resolution, and equal access to property rights. The most recent round of data collection for the project was completed in May 2018. This topic explores two sets of issues—the strength of credit reporting systems and the effectiveness of collateral and bankruptcy laws in facilitating lending. The most recent round of data collection for the project was completed in May 2018. This topic records the taxes and mandatory contributions that a medium-size company must pay or withhold in a given year, as well as the administrative burden of paying taxes and contributions and complying with postfiling procedures (VAT refund and tax audit). The most recent round of data collection for the project was completed in May 2018 covering for the Paying Taxes indicator calendar year 2017 (January 1, 2017 – December 31, 2017). Doing Business records the time and cost associated with the logistical process of exporting and importing goods. Doing Business measures the time and cost (excluding tariffs) associated with three sets of procedures—documentary compliance, border compliance and domestic transport—within the overall process of exporting or importing a shipment of goods. The most recent round of data collection for the project was completed in May 2018. The enforcing contracts indicator measures the time and cost for resolving a commercial dispute through a local first-instance court, and the quality of judicial processes index, evaluating whether each economy has adopted a series of good practices that promote quality and efficiency in the court system. The most recent round of data collection was completed in May 2018. Doing Business studies the time, cost and outcome of insolvency proceedings involving domestic legal entities. These variables are used to calculate the recovery rate, which is recorded as cents on the dollar recovered by secured creditors through reorganization, liquidation or debt enforcement (foreclosure or receivership) proceedings. To determine the present value of the amount recovered by creditors, Doing Business uses the lending rates from the International Monetary Fund, supplemented with data from central banks and the Economist Intelligence Unit. The most recent round of data collection was completed in May 2018. 2018 新加坡福智霖. All Rights Reserved.